Photo by GR Lindblade & Co.
Chandeliers are shown walled up above the celing in the Orpheum. Restoration will return them to the open. At right some of the detail in finishing done during the project. When the Orpheum Theatre unlocks its doors for the grand re-opening Sept. 15, patrons expecting to be impressed will not be disappointed. Sparkling crystal chandeliers hang elegantly in the lobby, cherub and swan sconces populate the walls, and the newly restored auditorium boasts a gold-leafed, hand-glazed ceiling and brilliant chandelier; it’s a bit like stepping back in time. After nearly 18 months of painstaking attention to detail, the splendor of the Orpheum Theatre reveals a masterpiece of restoration. From electrical circuits to artwork, the heady project involved hundreds of skilled craftsmen who recreated a landmark theatre in which the community can be proud. The Sioux City theatre features 66 make-up stages and three “main star” dressing rooms — one ADA accessible onstage and two stage left — complete with chandeliers. On stage right are two more star rooms, one each on the second and third floors. Jeff Byrne of KSM Construction said the restoration followed the building’s original blueprint, and that current pattern and fabric patterns are all like they used to be. The back stairway area of the lobby had previously been sealed off and Byrne said they tore out layers of concrete. They also ripped out the projection booth room in the upper auditorium. The booth had been added in the ’70s when the building was renovated into a two-screen movie theater. Lowered ceilings were stripped away and crystal chandeliers hung gracefully once again. New Metal Crafts, Inc. of Chicago restored the chandeliers and also built the new auditorium chandelier, a spectacular ornament that is 15 feet high, 9 feet in diameter, has a circular candelabra ring and 200 sparkling bulbs. The original chandelier disappeared from the Orpheum years ago. “This one is much nicer,” said Byrne. 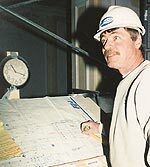 Denny O’Conner, foreman with Holtze Construction of Sioux City, looks over blueprints of the work that took nearly 18 months to complete. Though the structure of the building remains true to its original form, new features make the theatre ADA compliant and offer additional services. Shephardson said they also provide services for the hearing or sight impaired and have ADA drinking fountains and an ADA shower backstage. Additionally, more restrooms have been added to keep lines to a minimum. The old lower level men’s restroom/lounge was converted into one big ladies room and now features 25 stalls, complete with empire swan chandeliers. Three unisex “family” rooms also are available. Voids under stairways were strategically converted to concession stands; the building features six altogether. Most old wiring has been replaced and upgraded from 800 amps to 3,000 amps in order to accommodate the added air conditioning and stage lighting. “We have an all-new dimming system, and tied in new step lights when we poured the concrete,” said John Young of Thompson Electric. “We also cut over 450 holes in the floor where air will blow up from the air conditioning unit.” An air handling system — which contractors say is better than a new one and saved $1 million in expenses — will be reused. An Evergreen Company painter from New York daubs at the ceiling as a pattern emerges. Replacing light fixtures presented one of the theatre’s biggest challenges. Of the 300 original fixtures, 250 needed to be replaced. New Metal Crafts came through once again, producing fixtures as eloquent as the chandeliers. “I’m extremely pleased with the results but it wasn’t without an enormous amount of effort,” said Shephardson. A prominent vintage mirror graces the theatre’s front lobby, purchased by one of the theatre’s board members. Near the lobby’s back stairway hangs another venerable mirror, an Orpheum original that was re-goldleafed and re-glazed by the Evergreen Company of artists in New York City. The ceiling in the auditorium — a full seven stories high — features 250 red, white and blue lights encircling the gold dome. As with any theatre or concert hall, acoustics make the experience complete. And according to Stephen Radcliffe, Sioux City’s symphony conductor, the Orpheum’s is state of the art. Radcliffe said the shells are common in theatre, and often are hidden by curtains at the back of the stage. In addition to the shell, there is an acoustic sound reinforcement system which contains microphones and speakers in strategic places in the hall. This, said Radcliffe, wires the hall in a way so that everything is possible, although the symphony would likely not use it. Radcliffe said the wall coverings are all authentic, so that sound will have much the same type of acoustics as it did in years past. Shephardson said he is pleased with all aspects of the restoration.